Have Apron....Will Bake: New things and good for me? So, I do on occasion think that I should try new things...and not just over the top popcorn in my cookies things (honest). Though I will be trying those cookies with caramel popcorn (don't tell the hubbie he had a good idea). I have found a new blog (new to me) and I'm intrigued by a lot of her recipes. This blog I speak of, is Om Nom Ally. Ally has a lot of amazing recipes and ideas about gardening, etc. The first recipe that caught my eye, was the cheater strawberry jam. I have people in my life that are diabetic and people who just want to be healthy without all the sugar. So this was definitely the first recipe that I wanted to try. And what was even more interesting than the lack of (killer amounts of) sugar, was the use of Chia. Okay, I've heard of chia, but only in the form of pets. So of course I had to google it! Apparently the addition of water to chia makes it all jelly like. And this jelly like substance in a jam totally helps with making the cheater jam the consistency of....well...jam. So far the jam is looking good...very jam like. I took a taste of it and it tastes very fresh and strawberry-like. (good thing since it is strawberry jam) I don't think I've ever had strawberry jam taste so fresh. That's a good thing. I will be testing it tomorrow with scones (me thinks). Will see how the hubbie likes it. 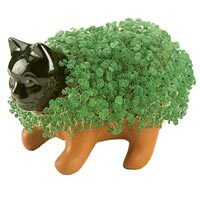 When I first heard of chia as a food the first thing I thought of was chia pets too, I remember I had a cat one that didn't look too different to your example pic here. It always amazed me that for years we were growing them for fun when the seeds were such a nutritious superfood!